Your home has a much greater chance of surviving the fire if you actively defend it. Tasmania Fire Service recommends that you should not plan to defend your home when the Fire Danger Rating exceeds 50 (severe) in your area unless you have created a defendable space and ember-proofed your home. Unless your home has a defendable space and has been designed and built specifically to withstand a bushfire, you should not plan to defend it if the Fire Danger Rating exceeds 75 (extreme). Tasmania Fire Service recommends that you should not plan to defend any home when the Fire Danger Rating exceeds 100 (catastrophic) in your area, regardless of any preparations you have made. If a fire starts on these days, you should leave for a safe place well before the fire threatens your home. If staying to defend your home against bushfires, it's important to protect yourself from radiant heat and from the numerous embers the fire will generate. 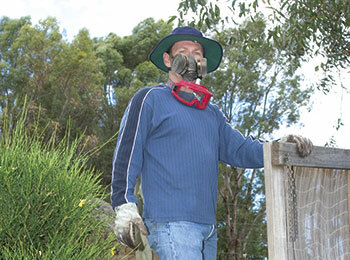 Wearing the clothing you would normally wear on a hot summer day will not provide you with protection during a bushfire. Wear clothing made from natural fibres (cotton or wool), such as overalls or a long sleeved cotton shirt and cotton trousers or jeans. Wear a wide-brimmed hat or safety helmet. Cotton or leather gardening gloves will protect your hands, and goggles or safety glasses will help keep sparks and embers out of your eyes. A good dust-mask will help protect your throat and lungs. It is very important to wear sturdy, fire-resistant boots or shoes so you can move around safely outside. If you create a defendable space around your home and choose to stay and defend it, your chances of success will improve if you have some basic tools available. As a minimum, you should have a ladder for access to roof gutters and into the roof space, a torch for moving safely inside the roof space, a hose and fittings, a rake and a strong bucket. A wet mop can be handy for putting out embers and small fires. If you can't rely on mains water, you need an alternative supply. You should purchase a small firefighting pump and hose. Look under 'fire protection equipment' in the Yellow Pages. A pump kit should include the pump and its petrol or diesel-driven motor, a suction hose, strainer and float (to get water to the pump), sufficient 19 mm or 25 mm diameter firefighting hose or 19 mm garden hose to reach around all sides of your home, a firefighting nozzle for each hose, and spare fuel. Practice using the equipment regularly. During the fire, make sure that the pump and hose are protected from high ambient temperatures and radiant heat and sheltered from embers and sparks. Any plastic pipes and fittings should be buried below ground or covered so they won't melt. Smaller fire-fighting pumps should be taken inside as the main fire front passes. Larger fixed pumps should be protected with a non-combustible cover or pump-housing. You are physically fit and emotionally prepared. Fire conditions are less than 'extreme'. Most people who die in bushfires are caught in the open, either in their car or on foot, because they've left their property too late, when the fire is approaching. If you are unsure about defending your property, you should prepare a Leave Early Plan as well. Download Stay and Defend Checklist & Plan Find out more about Community Bushfire Protection Plans and nearby safer places for your area. Be sure to connect garden hoses and prepare your firefighting pump or generator and extinguish any sparks, embers and spot fires burning on or close to your home. A hose or a wet mop is handy for this. As the fire front passes your home, it may be necessary to shelter inside from the radiant heat and ember attack. If possible, keep clear of large windows on the side of the house nearest the fire or you may be injured by breaking glass. The coolest place is likely to be on the side of the house furthest from the fire. Don't shelter in a part of the house you cannot easily escape from if your home catches fire, such as the bathroom, which often has windows too small to squeeze through. Only leave your home if it catches fire and you are forced out, or when it is safe to leave. Put out any fires burning on or near the outside of your home. A wool blanket will give you added protection from radiant heat. Listen to ABC Radio for news of the bushfire (use a transistor or car radio if the power is off), or visit the Tasmania Fire Service website. Drink water every 10 minutes to avoid dehydration. Clear roof gutters of leaves and sweep or rake leaves from decks and lawns near the house. Block your downpipes (a sock full of soil/sand will help) and fill your gutters with water. Move flammable outdoor furniture, doormats and hanging baskets away from your home. Close all doors and windows, remove curtains and close shutters if you have them. Put tape across the inside of windows so they remain in place if broken. Fill the bath and any buckets and containers with water. Put a ladder inside to access the roof space. 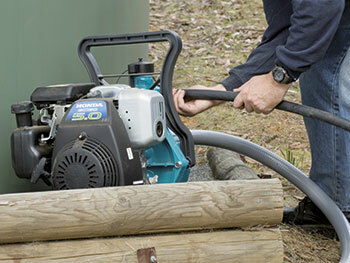 Connect garden hoses and prepare your firefighting pump or generator. Extinguish any sparks, embers and spot fires burning on or close to your home. A hose or a wet mop is handy for this. Don't stand on the roof with your hose. In bushfires, often more people are injured falling from roofs than suffer burn injuries. Don't waste water wetting down roofs and walls. Use the water only for extinguishing burning material. Ensure all family members and pets are safe. You should consider relocating children, other vulnerable people and pets well before the fire arrives. 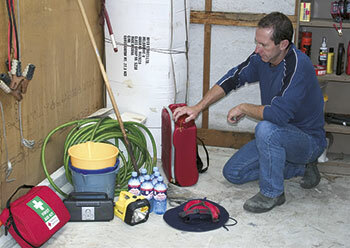 If you need to shelter, store your pump and firefighting hose where it won't get burnt. Take a garden hose and fittings inside and fit them to a tap in the laundry. Check around the inside of your house constantly for fire, including in the roof space. If fire breaks out, extinguish it using water you have collected in the bath and in buckets or with the hose attached to your laundry taps. Extinguish any part of your house that is alight. Your neighbours may be able to help. Check under the house and any decks, on the roof and inside the roof space. Check around window frames and door jambs, and under the eaves for any fire. Sparks and embers will continue to fall, so keep checking for several hours. Have a drink of water every 10 minutes to avoid dehydration. 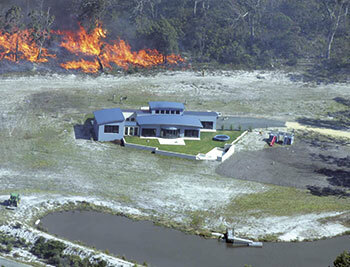 A well-prepared home will protect you from a bushfire's radiant heat in most circumstances. Do not attempt to flee in your car at the last minute. If you are defending your home against a bushfire and it catches fire and you can't put it out, you will need to exit the house before toxic fumes overcome you. If it is unsafe to exit immediately, close all interior doors and shelter inside at an exit as far from the fire as possible. Leave once it is safe outside, and before it becomes unsafe inside. Relocate to a nearby safer place. If necessary, shelter from radiant heat. This might be in your vegetable garden, the park across the street or your next door neighbour's house. You should identify nearby safer places in your bushfire survival plan. Choose a place that is very close, will be safe to get to and will be safe when you get there.